Welcome! We’ve created this web resource to help Cambridge English Literature students become more familiar with the portion of Troilus & Criseyde (Bk.III, ll.883-1820) set for the Part I medieval exam. 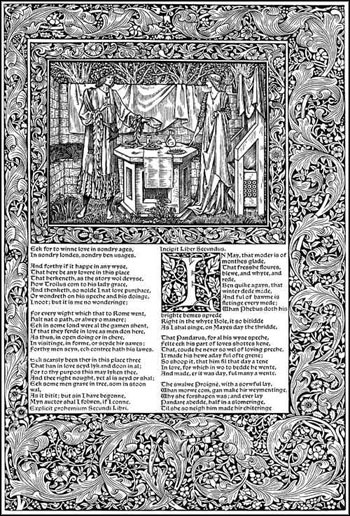 We hope these pages will support you in reading the text more carefully, thinking about its allusions, and learning how to apply your practical criticism skills better to Chaucer’s language. Although this open access site is aimed at Cambridge students, we hope it may be of interest to other readers of Chaucer too. In swich a plit, she dorste make hym cheere. Han litel laiser had to slepe and mete. Fox that ye ben! God yeve youre herte kare! Under hire nekke, and at the laste hire kyste. I passe al that which chargeth nought to seye. For other cause was ther noon than so. We hope this site will help you get to grips with what the commentary section of the Medieval paper requires and to improve your commentary and practical criticism skills. If you have any comments on how this site could be improved please email the site administrator Alex da Costa at ad666[at]cam.ac.uk. Alex da Costa and Barry Windeatt with the help of Madeleine Pepe (MPhil).